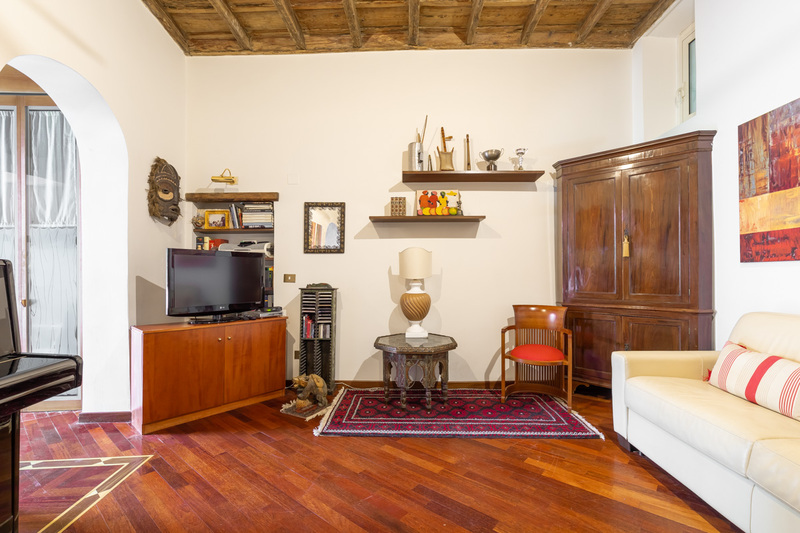 High wooden ceilings and parquet floors add to the charm of the cozy living room. 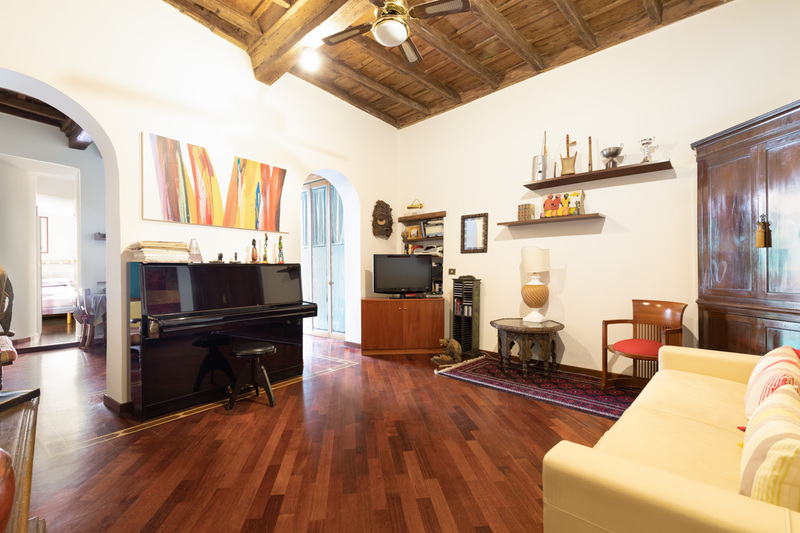 This warm room is equipped with an LCD TV, a piano and a couple of sofas (one of which is a sofa bed). And through the archway, there is another couch with a desk. A bright dining room decorated with beautiful original furniture. There is also a fully equipped kitchenette. Here you can use the stove and a fridge to prepare and enjoy excellent dinners at home. 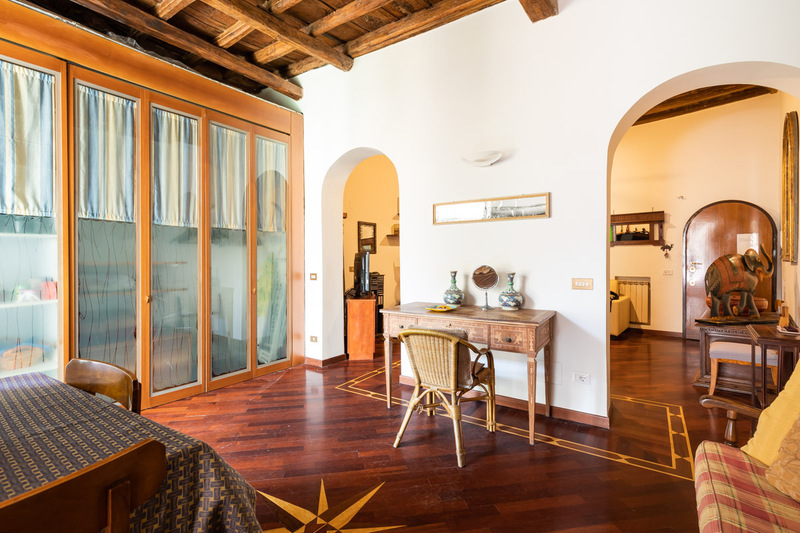 The peaceful master bedroom, with its queen size bed, has an en-suite bathroom with a shower. 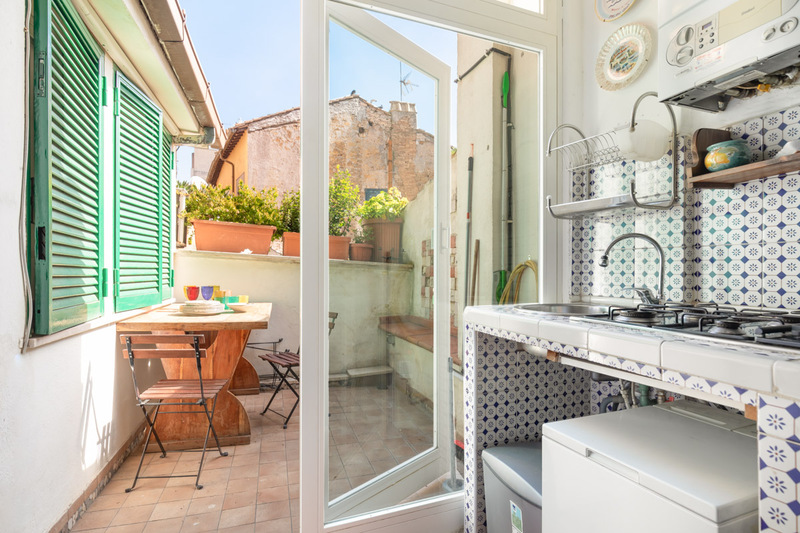 A small sunny terrace adds a beautiful finishing touch to this apartment. This is a great place to have breakfast in the morning. Alternatively, this can be especially pleasant on a balmy summer evening. Why not come here to watch the sun set over the Roman cityscape with an aperitif. 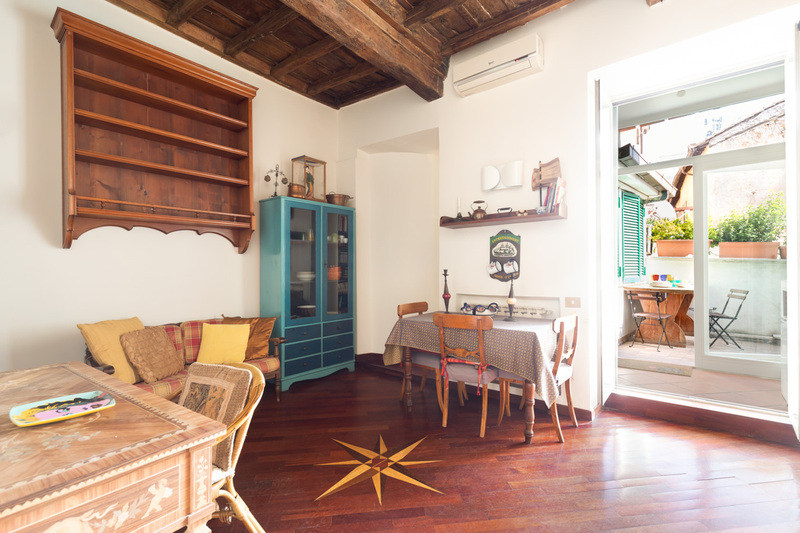 This Rome apartment will make your stay easy, comfortable and affordable! 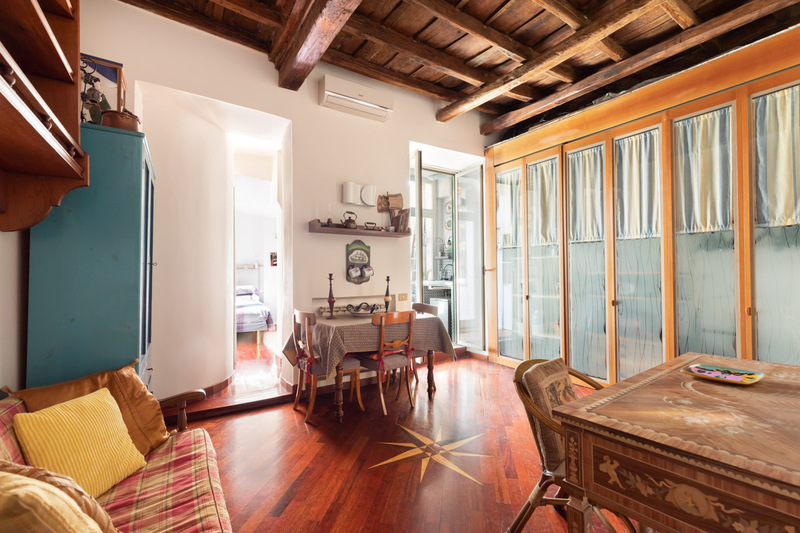 Trastevere is a typical and traditional area of Rome. It consists of many narrow cobbled streets. Its tiny backstreets do not, however, stop it being one of the liveliest and busiest districts come evening. 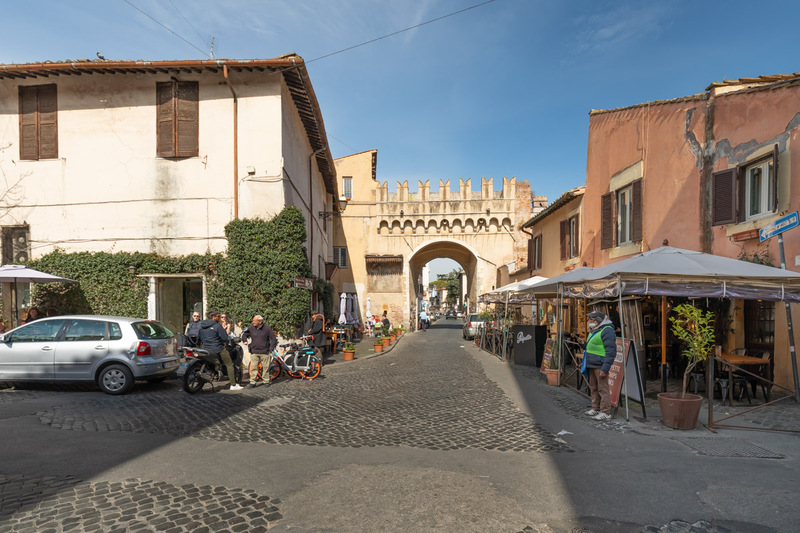 For example, this area is home to some of Rome’s best aperitivo, wine bars, and classically Roman restaurants. It also has quaint vintage shops and bookstores that are great for some afternoon perusing. Just across the Ponte Sisto you will find the Campo de’ Fiori. Come here in the mornings for their daily market selling fresh and local produce! Furthermore, from here you will be able to access many of Rome’s major sights on foot. 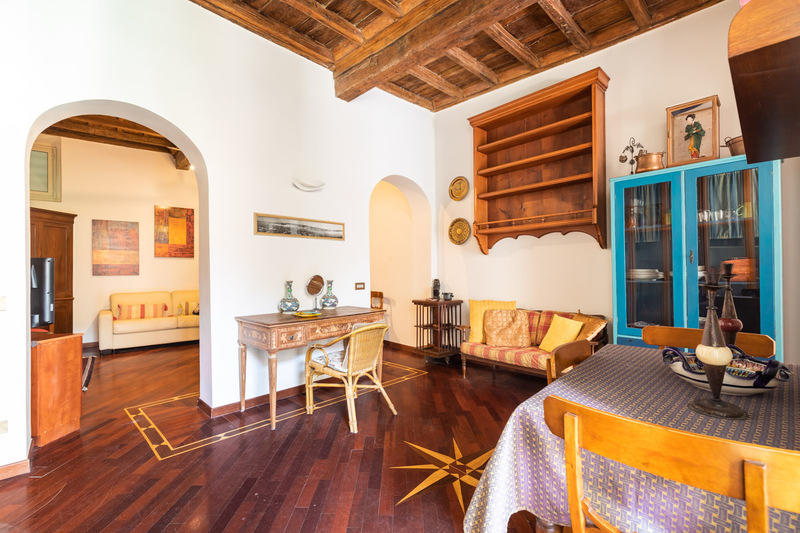 For instance, nearby you will find the Pantheon and Piazza Navona, just a little further and you will arrive at the Piazza Venezia. You might recognise the latter from the famous scene in Roman Holiday, where Peck and Hepburn stop off on the vespa. Following the Via del Corso down from here, you can stop off at the Trevi Fountain, the Spanish Steps, and the Piazza del Popolo. Behind the Piazza del Popolo you will also find the Villa Borghese park. Here you can hire pedal buggies and boats to explore its sandy paths and small lake. 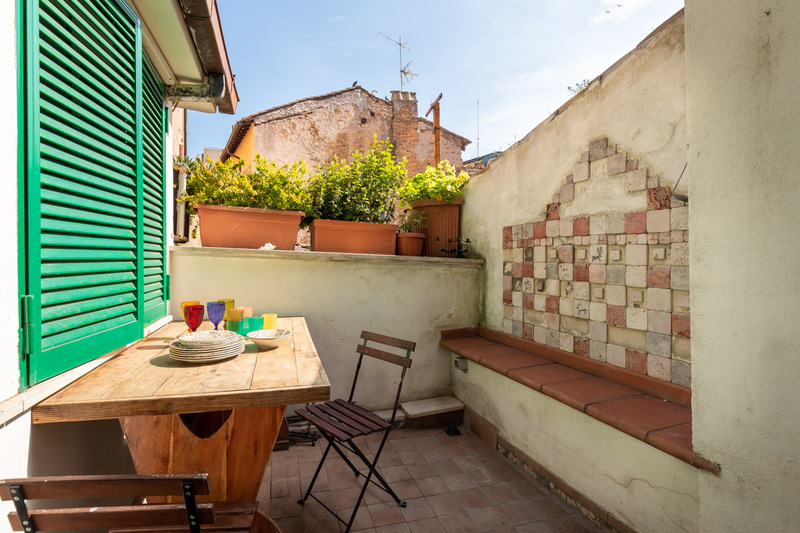 In addition to this, you can enjoy the views from its Pincio Terrace, which gives over the Prati district. We highly recommend visiting the Trevi fountain at night, when the crowds have died down. Moreover, the night-time illuminations add a magical dimension to the fountain’s waters. From Trastevere you can also walk to the Vatican City within half an hour, simply following the river North. In addition to this, many buses run along the riverside by Trastevere, meaning you will have access to the rest of Rome via public transport should you wish to. The apartment was very nice. It was in a great location. Just had to walk out to a number of bars and restaurants. Also, was not very far from all the attractions in Rome itself. 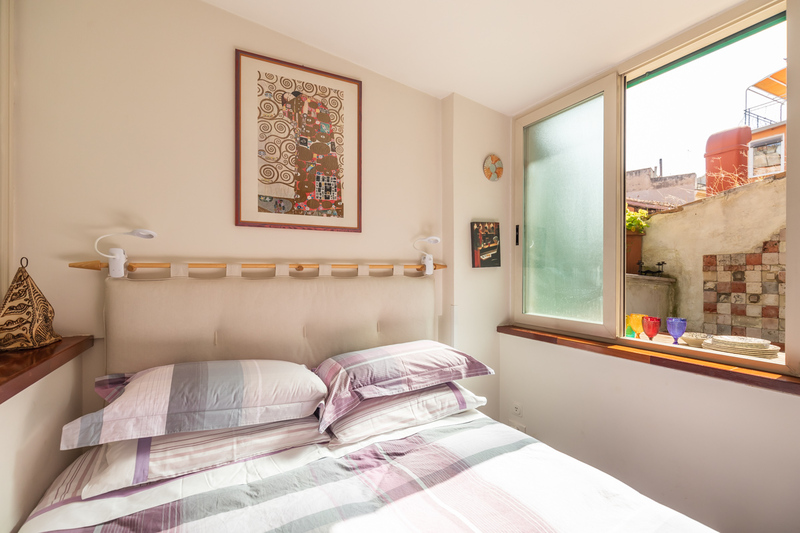 There was just one thing that was not the best which was a constant drip from an adjoining air conditioner that dripped non stop on the metal roof located just outside the...Read More bedroom window. That made it difficult to sleep sometimes. Everything was perfect except small details in the apartment: pillow very uncomfortable, not enough kitchen ustensils, no coffee table. For the arrival hour, we lost ourselves in the train and city and we were about to call 30 minutes before our arrival to confirm we were in the area, but the person came at the "estimated time" we had in...Read Moredicated on the site, without waiting our call (as it is requested on the site) and he had to wait for us for more than an hour. He was angry and we too in return because also very tired with all these problems from the morning. But no problem, our stay was very good so we forget this very quickly. We excuse ourself, we should have called to forecast we would be very late.